OAKLAND, Calif. -- We really should be ashamed of ourselves ... all of us. Stephen Curry opened the Golden State Warriors' quest for a three-peat by putting up 38 points and 15 rebounds while making 8 of 12 3-pointers, breaking Ray Allen's all-time postseason record for threes in the process, and all we wanted to talk about was Kevin Durant and Patrick Beverley's pseudo-trash talk that led to double ejections. It makes sense, presumably, because that was something new, something fresh. Curry going ballistic, becoming literally unguardable for long stretches of his team's most important games -- yawn. Seen it before. "I'm never surprised when it comes to anything with Steph shooting the basketball," Draymond Green said after Golden State's 121-104 Game 1 win over the Clippers. "I don't think there's much argument when anyone says he's the greatest shooter of all time. I don't know if you can find many people to argue that ... It don't shock me." Green was far from the only one to act like Curry's exploits were commonplace. "I mean, well, I expect it at this point," Kevin Durant said. "I'm not surprised by anything he does. You know, I expect him to come in and shoot well every night because he puts the work in." Wait a second, now we expect a guy to hit eight of his first 10 threes against playoff-level defense? We expect a guy to hit a heat-check three from 30 feet while falling to the floor? The world's best pole vaulter couldn't even clear a bar that high. 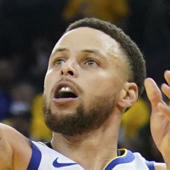 Never one to sing his own praises, Curry was typically humble and self-deprecating after the game -- "I shoot a lot of threes; I'd better make a lot of them" -- and seemed happier about his uncannily high rebound total than his marksman-like shooting display. "You see the ball and the angles and try to be at the right spot at the right time, and for us, any time a guard gets a rebound or any time anybody can just get it and go, it's hard to defend that, as well." Sure, he's willing to break down his box-out technique, but when it comes to shooting he remained vague: "If you had a couple go down, the momentum starts to pick up and you just see the rim a different way." If only it were that easy for all of us. One man who won't take Curry for granted is Clippers coach Doc Rivers. As Rivers is well aware, Curry averaged 33 points per game against the Clippers in three regular-season games on 54 percent shooting. Clearly, whatever game plan he had to stop the Babyfaced Assassin either was not executed or was ill-conceived. Rivers said that Curry must "see red like a bull" when the Clippers jerseys come into view. Curry was named the first-ever unanimous MVP after the 2015-16 season, and he might be better now. Let that sink in for a moment. Warriors coach Steve Kerr has, and he didn't hesitate to give his thoughts after yet another fireworks display. "It seems like every year that's the question: Is this the best he's playing, is this the best he's playing?" Kerr said after the game. "He's been playing his best for about five years, as far as I can see." The fact that teammates, coaches and fans take these Curry performances for granted plays into the fact that Curry too often gets left off of the list of all-time greats. In a player poll in The Athletic, NBA contemporaries were asked who they would choose to start a franchise, and Curry received 6.4 percent of the 125 votes. The 31-year-old's age relative to some of the players above him (Giannis Antetokounmpo, Anthony Davis, Joel Embiid) certainly played a factor, but still, you'd think a two-time MVP who has revolutionized the way basketball is played might garner slightly more support from his peers. He received zero votes for "Greatest Player of All Time," which is telling considering that Allen Iverson and Durant both got a vote. "You know, I was telling my coaching staff, I still think Steph Curry is one of the most underrated players in the NBA," Rivers said after Game 1. "I don't even know how that happens, but he is. He's taken for granted, and all I know is when he's on the floor, he is a handful, and he makes them better in so many ways. ... He just does everything. He's a great player."